Kurt Lewin was born on September 9, 1890 in Germany to a Jewish family. In 1905 the family moved to Berlin, and Lewin entered the University of Freiburg to study medicine, but decided to study biology instead, prompting him to transfer to the University of Munich, where he became involved in women's rights and the socialist movement. When World War I began, he served in the German army. After an injury, he returned home and finished his Ph.D. at the University of Berlin under the supervision of Carl Stumpf. 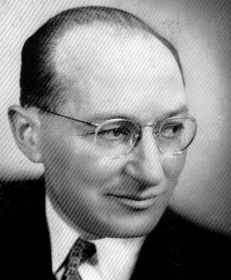 Lewin emigrated to the United States in August of 1933, and in 1940, he became a naturalized citizen. Lewin died February 12, 1947 in Massachusetts. Lewin spent six months as a visiting professor at Stanford University in 1930. After his immigration, he worked at Cornell University and for the Iowa Child Welfare Research Station at the University of Iowa. Later, he was the director of the Center for Group Dynamics at the Massachusetts Institute of Technology. In 1946, while at MIT, Lewin was asked by the director of the Connecticut State Inter Racial Commission for help in finding an effective way to combat religious and racial prejudices. He set up a workshop to conduct a "change" workshop, which laid the foundation for sensitivity training. This led to the establishment of the National Training Laboratories in Bethel, Maine. Following World War II, Lewin was involved in the psychological rehabilitation of former displaced persons camps occupants at Harvard Medical School with Dr. Jacob Fine. He also helped Eric Trist and A. T. M. Wilson establish the Tavistock journal, Human Relations. He also taught at Duke University for a time. Considered the father of social psychology, Kurt Lewin developed the nursing model known as Change Theory. He theorized a three-stage model of change that is known as the "unfreezing-change-refreeze model" that requires prior learning to be rejected and replaced. It states behavior as "a dynamic balance of forces working in opposing directions." The three concepts identified in Lewin's Change Theory are driving forces, restraining forces, and equilibrium. Driving forces are forces that push in a direction that causes change to occur. They facilitate change because they push the person in the desired direction. They cause a shift in the equilibrium towards change. Restraining forces are those forces that counter driving forces. They hinder change because they push the person in the opposite direction. They cause a shift in the equilibrium which opposes change. Equilibrium is a state of being where driving forces equal restraining forces and no change occurs. Equilibrium can be raised or lowered by changes that occur between the driving and restraining forces. This model of nursing consists of three distinct stages which are vital to the theory. They are unfreezing, moving to a new level or changing (or movement), and refreezing. Unfreezing is the process which involves finding a method of making it possible for people to let go of an old pattern that was, in some way, counterproductive. It is necessary to overcome the strains of individual resistance and group conformity. It can be achieved by the use of three methods. First, increase the driving forces that direct behavior away from the existing situation or status quo. Second, decrease the restraining forces that affect movement negatively. Third, find some combination of the first two methods. The second stage involves a process of change in feeling, behavior, thought, or all three, that is more productive in some way. The refreezing stage involves establishing the change as a habit so it becomes the standard. Without the refreezing stage, the old ways can easily return.